As the annual Rule 5 draft approached to wrap up this year's MLB Winter Meetings, the usual anticipation of what possible gem the Phillies could select wasn't there. Instead, the concern about which prospect the team that has been stock piling young talent in recent years could lose to another club was the prevalent feeling. As things turned out, the Phils lost just a single player in the big league portion of the Rule 5 draft and one additional player in the minor league portion. Cleveland selected lefty reliever Hoby Milner in the big league phase of the draft while Tampa Bay chose minor league hurler Jairo Munoz in the minor league portion. 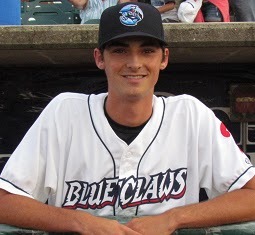 Milner, 25, was a 7th round draft pick by the Phillies in the 2012 and has displayed exceptional numbers in recent season after switching from a starting role to the bullpen. Combined with Double-A Reading and Triple-A Lehigh Valley last season, the Texas native sported a 5-4 record with a 2.49 ERA along with six saves while striking out 76 and walking just 15 in 65 innings of work over 49 appearances. The Indians will need to keep Milner on their 25-man big league roster for the entirety of the 2017 season, or he must be offered back to the Phillies. Munoz, a 25-year-old righty, pitched in just seven games in 2016, missing time with an arm injury. He sports a 3.26 ERA in 62 career games. The Dominican Republic native was signed as a minor league free agent by the Phillies prior to the 2015 season. The Phils selected Jorge Flores in the Triple-A portion of the draft. The 25-year-old infielder was originally draft by Toronto in the 19th round of the 2012 draft. In 114 combined games with Class A Advanced Dunedin and Double-A New Hampshire last season, Flores tallied a .211/.280./286 slash line.